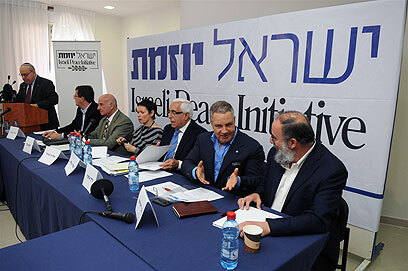 A group of businessmen, former defense establishment officials and leading professors presented before the press on Wednesday the "Israeli Peace Initiative" that aims to restart the stalled Israeli-Palestinian negotiations, and urged Prime Minister Benjamin Netanyahu to adopt their proposal. The manifest calls for a two-state solution based on the1967 borders, with a Palestinian state stretching across most of the West Bank, with east Jerusalem as its capital. The authors noted that developments in the Arab world and Israel's relatively sturdy economic and security situation present a good opportunity to adopt the initiative and implement it. They said that that the proposal has been in the works for some time both in Israel and Arab countries, and what drove them to make it public is the Palestinian intention to declare the establishment of an independent state next September. They intend to promote the manifest in Israel, the West and in the Arab world. "There are extremists both in the south and the north," Moshe Shahal said. "Without the agreement of the Arab world, we won't be able to reach any accord." The two-page document was formulated in response to the 2002 Arab Peace Initiative, and was inspired by the unrest currently shaking some Arab nations. Among the signatories are former former Mossad Chief Danny Yatom, former IDF Chief Amnon Lipkin-Shahak, General (Res) Amram Mitzna, former Minister Moshe Shahal and business mogul Idan Ofer, as well as Dalia and Yuval Rabin, the children of slain former Prime Minister Yitzhak Rabin. The authors said that Israeli experts based the initiative on previously-brought up solutions, such as former US President Bill Clinton's outline from 2000, former Prime Minister Ehud Barak's Camp David proposals and former Prime Minister Ehud Olmert's conclusions from the Annapolis Process, as well as other findings. "We have strong reasons to believe that the initiative will be welcomed in Arab capitals and by the Palestinian authorities," the proposal document read. One of the initiators of the proposal, former Shin Bet chief Yaakov Peri, said on Wednesday that he recently sent a copy of the manifest to Netanyahu, who is expected to review it and give his opinion in the coming days. According to Peri, President Shimon Peres also went over the initiative, and made suggestions for improvement. "It's not a political initiative," said. "We want to encourage the government to say yes and put an end to the fighting. We are not complaining to the prime minister…we know that he is a talented man. "We believe that he can lead this kind of initiative, and he is the one who would win public support," Peri added. As per the proposal, a Palestinian state would be declared as the nation-state of the Palestinians, and Israel would be recognized as the nation-state of the Jews, where the Arabic minority would have equal rights. In addition to the 1967 borders, land exchanges would be agreed upon. The outline further states that the east Jerusalem would be the new state's capital, with the city's Jewish neighborhoods remaining under Israeli sovereignty, and its Arab neighborhoods under Palestinian sovereignty. As for the issue of Palestinian refugees, the plan proposes financial compensation and return to Palestine, not Israel. Mutually agreed-upon "symbolic exceptions” would allow some of them back into Israel. On the Syrian front, the document calls for Israeli withdrawal from the Golan Heights, with minor, agreed-upon modifications and land swaps, to be implemented in stages across a five-year period. See all talkbacks "Authors of peace initiative invite Bibi to take lead"